I am a hibiscus lover and I'm not afraid to admit it. I have several varieties in my yard and am transfixed by the beauty of the blooms and their depth of color. 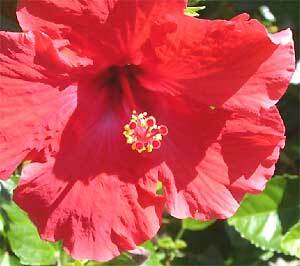 So imagine how pleased I was to learn of Jason's web site Strictly Hibiscus. This site offers every color you can think of and then some. My favorites are generally in the yellow or red categories. I particularly like Sun Kissed - a mix of bright yellow edging with white and a magenta center, and Intense Passion - a double bloom with red, coral and yellow. There's even a Hibiscus of the Month Club to check out. Go out and visit when you get the chance. It's worth it. Happy Gardening.